There are numerous stories of restorations that are half completed or in some stage of ruin after being worked on and then left to rot. Any number of these vehicles can be spotted in sheds and garages at various locations around the country. When you stop at these places to ask to buy these vehicles the likely response is "I'm restoring it". But at what point is "restoring" no longer the valid word to use? Drop the "re" and just say "storing". And why does this happen so often? Did they get stuck at a point that they lacked the skill or knowledge to complete? The more likely story is that all their funds were exhausted much faster than anticipated and total costs got too high and there are still a couple major parts missing that cannot be found but are essential to moving forward with the project. First of all, lets not sugarcoat it, there is a LOT of money to be spent to complete a vehicle from start to finish. Paint and materials at lowest cost will run at LEAST $2000 to upwards of $4000 just for sandpaper, paint, primer etc. (UPDATE: Thanks to the EPA costs have increased, You can now double these prices as of 2014). Not to mention the cost of new/replacement parts, bolts and hardware for assembly, chrome, body filler, patch metal, and special tools you may need to finish the job. But the majority of the investment, whether you are using a restoration shop like ours or doing it yourself, is time. It would be great to assume that you can have a car done from start to finish in a week, but that is a dream unless you are on one of those reality shows, and most of these cut a lot of corners and don't create a driver friendly car that will last. 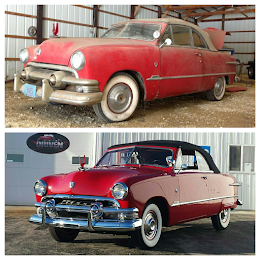 In most cases you can't complete frame-off restoration for less than $20,000 and that's if you do the majority of the work yourself so there is no hired labor. However, please consider that paying that labor on certain portions of the restoration will pay you back in longevity of the finished project and value of the vehicle in the future. So for those of you that are doing your own work, how do you stay motivated through completion? How do you avoid "storing" your project and wishing it was finished? As much fun as it is to get the project started, it pales in comparison to the first drive down the road when it's done. Use your resources and allocate your time and funds efficiently. With careful planning and with some sweat and patience you will finally get out on the road. At Driven Restorations we can provide you resources to assist you in completing your project with a customized project portfolio. We'll tailor it to your needs for a nominal fee and set you on track with documentation assistance, parts location and research so set you on your way to Make it Driven. Email Molly at Drivenrestorations@gmail.com to find out more.